N class 31874 is being stripped down and rebuilt in Swanage Railway’s Herston Works with the boiler work being carried out by Adam Dalgleish Engineering Ltd. Overhaul updates can be found below or here. Information on the history of the loco can be found on its Biography page.The loco was once thought to be beyond economic repair and lay in an open siding for 18 years. With support from the Swanage Railway Trust and your help, it is possible to return this unique and important loco to steam. Thanks to a Department of Transport and RSSB grant 31874 overhaul will now include the equipment and certification required for Main Line Operation. The engineering specification for the work was already being carried out to the standards required for use on the main line and initial VAB (Vehicle Acceptance Body) inspections have been carried out. The grant however only covers GSMR, OTMR & TPWS4 and we still need to find the funds to complete the overhaul. The boiler lift in Aug 2014 marked the start of the overhaul. It was taken to the Stockton works of Adam Dalgleish Engineering Ltd. along with the tender. 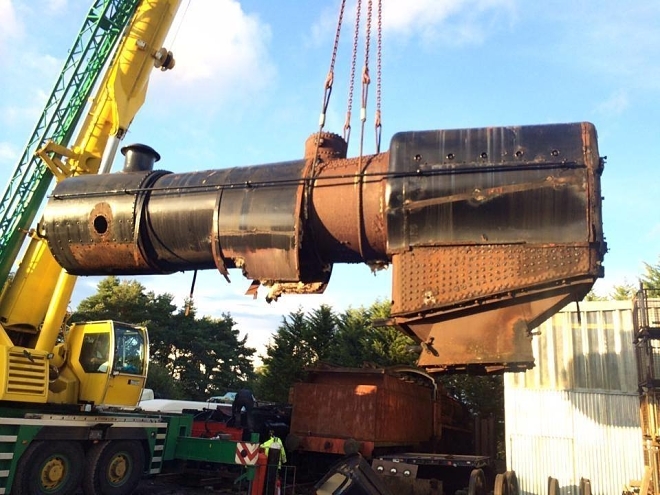 The remainder of the loco was lifted from its wheels and taken to Swanage Railway’s Herston Works. The estimated cost of the work is currently around £400,000. We urgently need your help to keep the work moving forward. 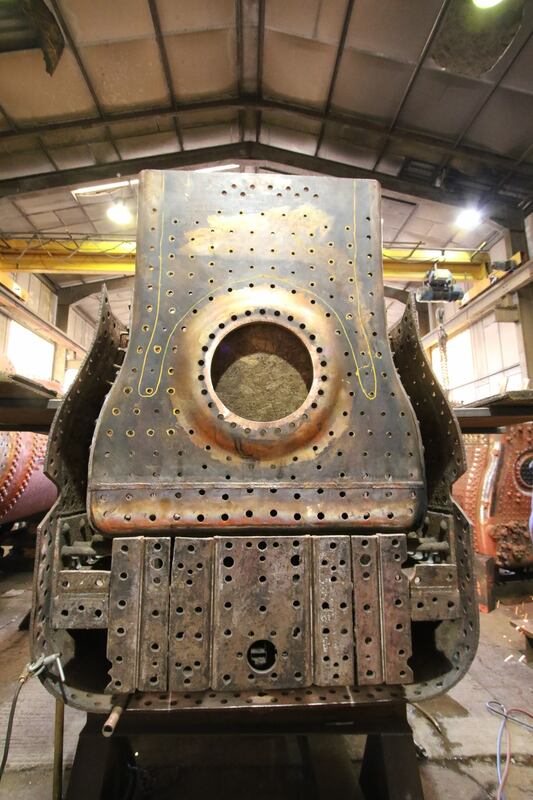 It is currently hoped that the loco will be complete in late 2016 or early 2017 subject to available funding and the time-scales of the boiler work. Please consider making a small donation towards the work. Visit our Donations Pages to find an number of easy ways give. Adam writes “Under contract from Swanage Railway, ADE is carrying out one of its most extensive repairs to date to the boiler of Southern Railway design N-Class No. 31874. Following heavy corrosion, extensive plate renewal is required, including half side plate replacement to both the steel wrapper & inner copper firebox, replacement half throatplate sections to both the steel wrapper & inner copper firebox and full replacement of outer steel backhead & inner copper firebox backhead, all hot flanged in house by our team of Boilersmiths. Following these works the firebox will receive around 300 new side stays and be reunited with its refurbished foundation ring. The boiler work will be completed by overhauling and refitting the boiler manafold, regulator and other fittings then steam testing before return to Herston Works, Swanage for reuniting with the Loco Chassis. After the Boiler was lifted the the loco was lifted of its wheels. 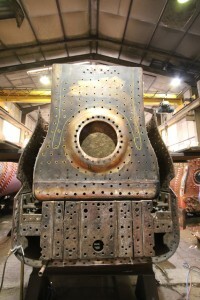 The remaining chassis consisting of frames, cylinders, bogie, motion, braking and running gear were cleaned using high pressure water jet which stripped the dirt and paint back to bare metal. 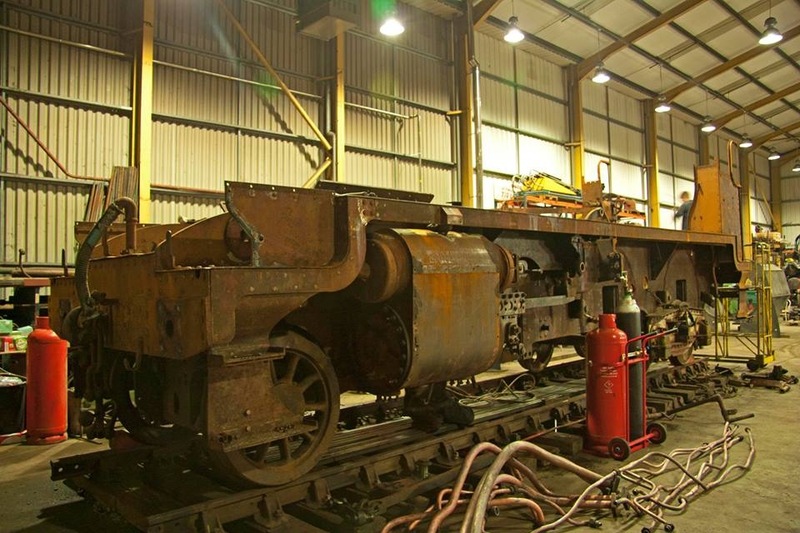 The chassis was then transported to Herston Works where it was stripped down and inspected before the long task of refurbishment and reassembly could start. 31874’s Partially stripped frames on accommodation boogies shortly after being high pressure water cleaned and entering the works. 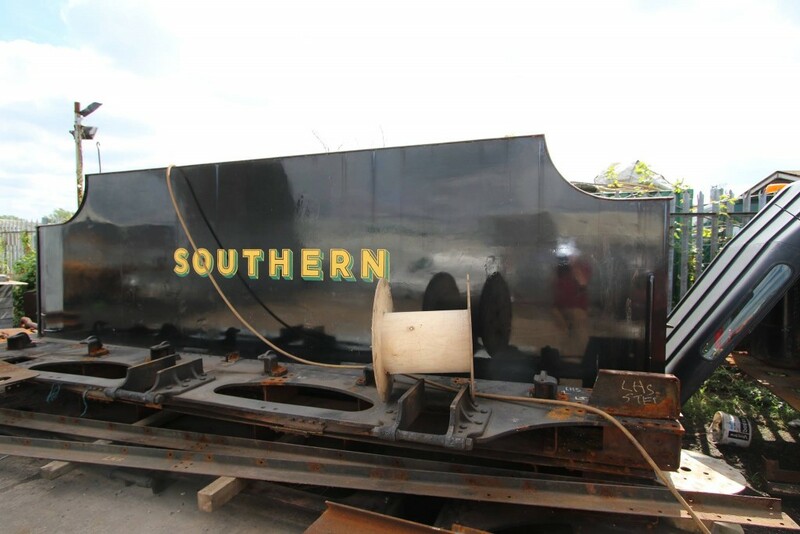 The tender was initially stripped down of site by Adam Dalgleish Engineering Ltd. with reassembly now being carried out by Southern Locomotives Ltd. After the tank was lifted from the frames we discovered that the long period of storage had left the frames in a worse condition than we expected. We had always planned to replace the front and rear drag boxes but with the tank off, the frames were found to be too badly wasted for economic repair. Tender tank after lifting with its disassembled frames in the foreground. On the up side, the tender tank its self was in better condition than first thought and most of it has been saved. After finding the frames to be to far gone we had planned to construct a new set using the castings and axle boxes from the original but work scheduling issues have forced us to revise that and we will now contract Southern Locomotives Ltd. to overhaul 31625’s tender frames at Herston Works and install the tank on that. New steam heat, vacuum and water pipework will complete the tender.